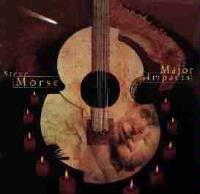 Steve Morse has come up with a very intriguing concept for an album in this release. The disc is an all instrumental excursion through his varied influences. Each cut focuses on a different artist or two that have helped to form his musical sound through the years. Rather than play songs or medleys of songs by the chosen musicians, Morse develops his own original pieces with sounds based in the modes of these artists. The result is quite a great album. Half the fun of this one is looking at the clever titles that he has chosen to identify the cuts. 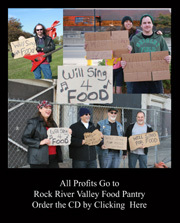 The other musicians on this CD are Dave LaRue and Van Romaine. Stomping fast pace rock and roll with a minor taste of jazz and just a bit of a southern twang, this cut is Morse's take on Clapton's Cream, and a great high energy way to start the album. Beginning with a hard rocking riff, the cut quickly shifts gear to a more laid back sort of groove. The cut alternates between these two modes in Morse's take on Hendrix. After a time, the cut switches gear into Jimi's screaming, nearly out of control jamming style. Next Morse tackles Jeff Beck. The result is a gutsy sort of rock and roll jam with a great and tasteful sensibility. The cut then shifts gear into a very progish jam that encompasses the stylings of a couple periods of Rush's career, throwing that sound into the mix for good measure. This is a great jam. From the first jingle jangle on this one, it is obvious that the influence here is The Byrds. Morse does a reverent and fun rendition of that classic rock sound. This time Zeppelin is obviously the impetus. It starts by focusing on the acoustic approach ala "Black Mountain Side" type of work. The cut moves into more mysterious sounding Page territory, but still in an acoustic vein. Then it shifts into electric mode, still playing a solid tribute to the Zeppelin sound of such music as "Rock and Roll" and "Whole Lotta Love". The composition integrates the earlier mysterious acoustic mode as a layer atop this hard rocking backdrop to end the piece. Intricate acoustic tones begin this one in fusionish modes which really build. This piece is a tribute to John McLaughlin. Based on a great rocking groove focusing on the somewhat countrified tones of Keith Richards, Morse's arrangement really captures a lot of the serious stylings of "Keef" without actually copying any of them. Based on the sound of Leslie West, this one is a scorcher in the same vein as Mountain's classic "Mississippi Queen". The song makes several musical changes in arrangement, but all still within that crunchy tasteful rock and roll format. Obviously this one is a George Harrison approach, and a great one at that. First in the whole "My Guitar…" mode, then shifting to a more bouncy Beatlesesque approach for a time. The cut continues to build on the Harrison approach in a very entertaining and expressive direction. Next is a take on the Allman Brothers sort of progish southern rock jamming. This number is quite strong and inspired, really capturing the sound without anything near direct copying. It features a great uptempo jump late into it that really grooves. A very solid progressive rock mode encompasses this track. Shortly after the intro, the number becomes distinctly Kansas oriented and begins building nicely, getting quite hard edged at times. Then Morse takes on some very Yesish textures. As it builds to a crescendo, the cut is reborn in an acoustic mode ala Howe that leads to a nice mellowish prog jam which also has definite Yesish stylings. The mellower mode ends the piece and the disc in great style.